The BW-1 Blue/White light is a great tool for fluorescence night diving, combining a blue LED for exciting fluorescence with a white LED for general viewing. This two-lights-in-one feature keeps the safety and convenience of the white light always available for immediate use. The BW-1D Dive Package ($575) includes the BW-1, one Filter Visor, and one Mask Strap Wrapper for outfitting a single diver. The BW-1B Buddy Package ($615) includes an additional Filter Visor and Strap Wrapper so that two divers can share the fluorescence experience with one light. Note for marine scientists – the blue LED in the BW-1 can be operated in either steady or flashing mode. 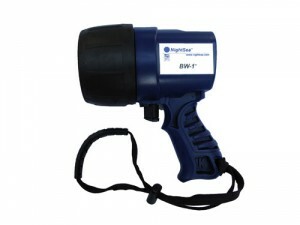 The steady mode is ideal for finding fluorescence at night, while the flashing mode lets you find small fluorescing specimens even in the daytime.